Old Las Vegas is actually downtown Las Vegas—they are one and the same. Located a few miles north of the Las Vegas Strip, old downtown Las Vegas is the original townsite of the city that was founded in 1905. So naturally, it is the oldest part of the City of Las Vegas—its historic center and original gambling district. Today, it is also the city's rejuvenated central business district and the beating heart of the famous gaming and resorts mecca in Nevada’s Mojave Desert. The district is home to a multitude of businesses, government buildings, and tourist attractions— namely the great cheap food and free entertainment of the Fremont Street Experience, the pulsating Viva Vision shows, the new Las Vegas City Hall, the Smith Center for the Performing Arts, and dozens of outdoor concerts, casinos, restaurants, bars, shops, and art galleries. It has become a popular hangout for both Las Vegas locals and visitors looking to get away from the mega-resorts on the Strip. The area that would become downtown Las Vegas was first settled in 1855 by Mormon missionaries from Utah, whose Old Mormon Fort is now a Nevada State Park. Even so, the future of Las Vegas was far from a sure thing because the Mormons left soon after that. Eventually, other settlers arrived and took advantage of the location's natural springs to develop agriculture. When the railroad came to town in 1905, the City of Las Vegas was founded. Until the mid-1970s, when you spoke of Las Vegas, you meant downtown Las Vegas, not the Strip. Then the glittering mega-resorts were built on the Las Vegas Strip, and the old downtown became a decrepit afterthought. It stayed that way for decades, until Oscar Goodman, reputed to be the onetime go-to Mafia lawyer who served as Sin City's mayor from 1999 to 2011, spearheaded a massive revitalization effort with the help of local business leaders. Their work turned the historic center of Las Vegas from a seedier part of town into the heart of the local scene. With the Fremont Street Experience and the surrounding old-school casinos at the center of the revitalized zone, the downtown area is once more attracting major tourism. Downtown Las Vegas covers about 110 acres and features several neighborhoods, all with a distinct feel. They range from Fremont Street, the main thoroughfare of old downtown, to the neon glitz of newly created Fremont East, the galleries and studios of the Arts District, and the hip government center of Symphony Park. For most visitors to Las Vegas, this is downtown. They come for the Fremont Street Experience, which is delineated by Viva Vision, a massive blocks-long LED screen—said to be the world's largest—that displays mesmerizing rock images and color-saturated psychedelic montages. Free outdoor summer concert series, special events, and roaming street performers bask in its glow. This gratis light-and-music show remains one of the must-see attractions in Vegas. Visitors can fly high above it all on thrilling zip lines, including the world’s largest slot machine—the SlotZilla zip line. Add the Fremont Street casinos, among them the iconic Golden Nugget and the Four Queens, and there are plenty of things to occupy an evening or two here. 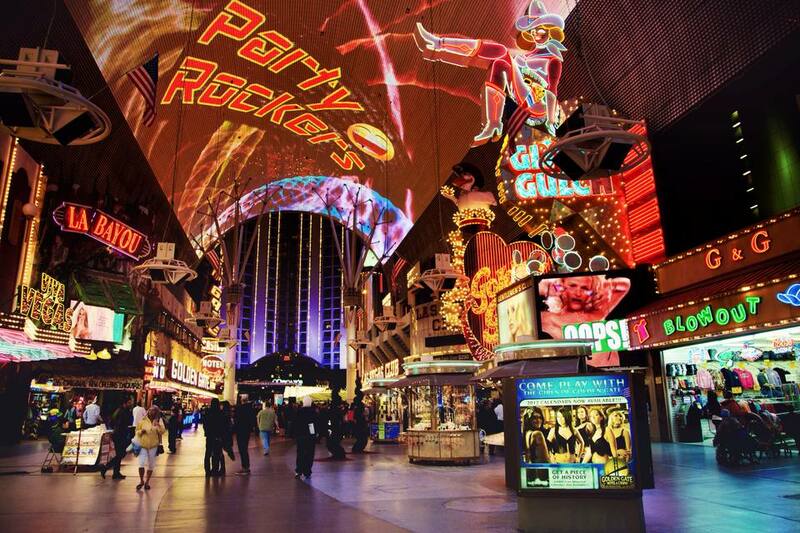 In 2002, as part of Downtown's continued revitalization program, the City of Las Vegas created Fremont East. Located at the eastern end of the Fremont Street Experience, it spans Fremont Street from Las Vegas Boulevard to Eighth Street; it continues one block north of Fremont Street to Ogden Avenue and one block south of Carson Avenue. Home to vibrant bars and restaurants, the area has become famous for its impressive neon signage. Home to Vegas' First Fridays, a monthly arts festival celebrating the work of local Vegas artists, musicians, and culinary creatives, the Arts District is named for its many art galleries and studios. It is literally the heart of the Vegas art scene. Sit yourself down in an outdoor cafe and be prepared for some of the most colorful and eclectic people watching in Sin City. This one-time railroad yard was purchased by the City of Las Vegas in 1995 with the eventual goal of making it the center of a revitalized downtown. It underwent massive reconstruction, and these days, it is home to the new Las Vegas City Hall and the amazing Smith Center for the Performing Arts, as well as the base of numerous businesses, including Zappos. Development plans promise to make it one of Las Vegas' hippest addresses.